Thanks to all of the Garden Tour participants who volunteered their gardens--including Kaye Carlise, Doug Euth and Steve Riffle, Dan Harkless, Samantha Skidmore and Jerv Janney, Jay Luster and Neil Makin, Marian Campbell, Kathleen Luarie and Marty and Truman Annis. Thanks also to the Committee members, Eileen Griswold and Monica Snow, Co-Chairs, Andrea Tinch, Publicity, Glenna Rogers, Sharon Patterson, Sherry Allessandro Tickets and Hospitablity. Because printing and refreshments were donated, the tour netted $453 for the Oregon Historic District Society. If you missed the tour, the text that was contained in the Garden Tour Brochure is transcribed below. You begin your tour on the historic site of Newcom School which was built in 1857. The Oregon residential neigbhorhood was platted in 1829, the year the canal opened, making the neighborhood the oldest in the city. We were called Oregon as early as 1840 when the Oregon volunteer fire department was organized. The closing of the canal, the 1913 flood and the housing shortage during WW II led Oregon toward a date with the wrecking ball -- as befell much of the Haymarket area north of Wayne Avenue. By the mid-60's preservationists won a moratorium against demolition. In 1972 the neighborhood was placed on the National Register of Historic Neighborhoods -- leading the way for nine other historic districts in the city. Newcom Park, once paved over and surrounded by chain link fence, was redesigned in 1975. In 1985, residents designed and built the gazebo. The commemorative planter, embossed with the Oregon lion, was added this past fall. In 1998, volunteers also designed and conducted a major capital fund drive for the entranceways at E 6th and Van Buren. Our Beautification Committee maintains the plantings and landscaping for all three areas. Proceeds from today's tour will benefit these efforts. Welcome and enjoy your walk through Oregon. With a decade of constant hard work and boundless creativity, Doug and Steve have transformed one of Oregon's abandoned churches into an architectural masterpiece. Today it's hard to believe that their front yard was once covered with scaffolding and an ancient furnace as they re-roofed their home one summer and installed an entirely new H&AC system the next. The front and side yard is designed with classical lines, plant materials and lighting to complement the massive and simple architecture of the church. The back and side yards have been transformed into a place to entertain many friends. Be sure and notice the lion fountain, exquisite tile work and the large hanging baskets -- all extending the garden into the interior space. The many tropicals in the garden are wintered over in a greenhouse area in the basement. Biggest Challenge: Back and side yards -- no space, no rain, no sun. Favorite Plant: Anything that lives. After many years of neglect, Dan Harkless a new tenant, took over the care of the outside of 18 Van Buren -- to the delight of the entire neighborhood. The first summer consisted of a massive clean-up--with a setback the next summer when construction work next door damaged the yard. 1999 and 2000 saw more clean up, more plantings and the first pond. One is a fish pond complete with waterfall and the second built this summer will be used as a flower pond. In just a few years, flowers, bushes, ground cover and trees once mowed over have managed to come back--including crocuses, lilies, roses, catalpa, wisteria, myrtle and ferns. The garden itself is a testimony to the gracious neighbors who have contributed to its rebirth. "You could call this 'The Orphan's Patch' because virtually all of the perennials were donated by fellow gardeners in the District." Future plans include two more beds this summer, a gazebo entry near the back porch and more work on the ponds. 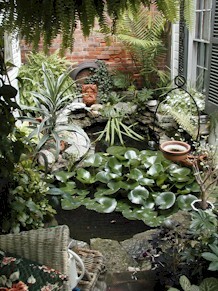 Gardening Tip: "If you can't get grass to grow - dig a hole and make a pond! It's much easier than you think." Kaye begin transforming concrete and grass into her lovely garden in 1990. A concrete slab covered the area where her pond now bubbles. Passers-by have often commented that Kaye's garden looks like a bit of the Caribbean. The environment she is striving for? "Paradise of course." Don't miss any corner of this beautiful urban paradise?overflowing with sensual varieties of plants, vines and water life. Biggest Challenge: Keeping ahead of the helicopter seeds and leaves from my trees?and finding one more place for a new plant. Favorite Plant: David Austin roses--especially the Abraham Darbys. Kaye has added a second. Gardening Tip: "Start small, think expansively. Begin early, work late. Remember, life changes and so do gardens." Jay and Neil have created a quiet resting place to sit and enjoy the dark greens and bright colors of their garden. In the past four years, they have conquered overgrown ivy and removed bright red, bark mulch that covered the yard. Their garden extends into the tree lawn and has inspired other gardeners along the block to do the same. Their two seating areas on the front porch and in the back provide places to enjoy their wide variety of plants including ten clematis vines, unique shade lilies, perennial ageratum and a flourishing climbing peace rose. The bird baths and lush fir tree provide a haven for nesting birds--with two doves taking up residence this spring. Biggest Challenge: Knowing what to put where and learning to be patient while nature takes its course. Gardening Tip: Practice patience and avoid the temptation to over crowd. Marian relies on a palette of soft, light colors to promote a sense of well being in her garden. As you enter the trellised gate inter-twined with roses and clematis, catch a wink from Marian's little fox. You feel you are in the midst of the English country-side. Take special note of the Staghorn sumac that is spectacular in every season. Of all the beautiful plants in her garden, for Marian, the twice-blooming irises take the prize. "The thrill of cutting a spectacularly beautiful iris in October and November is something very special." Gardening Tip (from the Editor): Marian punctuates the rhythms of every season with one spectacular focal point in her garden. From her glorious soft pink dogwood in spring, to the twice-blooming iris in the fall to her lovely evergreen filled sleigh in the winter. A stop by Marian's garden is well rewarded. These two neighbors have designed their garden areas to flow and include each other's yards. Marti and Truman have lived at 34 Green for 40 years and Kathleen has improved her home over the past 10 years at 28 Green. The garden is designed to have street interest while still providing privacy in the back. The new deck off Kathleen's house provides a spectacular view of the garden below. The gardeners' pride and joy is the Tri-Colored Beech in the front yard. Don't miss the rose on the trellis in the back yard. It was started from Kathleen's great-great-grandmother's rose plant. Challenge: The gardeners' biggest challenge has been getting plants to survive in the mound in the front yard. Created by the nursery that completed the initial landscaping plan, the mound is chock full of clay. The gardeners are now using a gravel base for all new plants with the hope that they will survive. Gardening Tip: Buy trees and large plants from garden centers with guarantees. Samantha begin her garden just five years ago and has created a flourishing abundance of color, contrast and textures working with both the sunny and shady areas of her garden. Her original vision included lots of roses and peonies--and now just five years later, her favorite plants are indeed her climbing roses on the fence, a variety of peonies and the hydrangeas around the porch. Samantha has collaborated with Joe Young who did the basic design, Ziggy Peterson and Sue Jackson--creating a truly breath taking and totally enthralling environment. Biggest Challenge: Making the fences more attractive with vines and roses and working on the shady walkways along side the house. Gardening Tip: Don't be afraid to move plants. Some plants that weren't doing well are now flourishing. They just wanted a new home.